Rooms are equipped with satellite television. In our offer accommodation only for workers. At disposal: kitchen, bathrooms. On the premises parking. 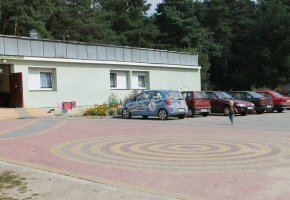 The building is located on the route - on the section: Toruń - Olsztyn. We invite to cooperate firms. Rooms with bathrooms. On the premises parking. 5 km to Toruń. We invite to cooperate firms. Rooms are equipped with: TV. At guests' disposal: kitchenettes, bathrooms, wireless Internet (Wi-Fi). On the premises: lit and monitored parking lot. At guests' disposal generally accessible bathrooms, fully equipped kitchen, room with TV. We guarantee satisfying stay and nice atmosphere. Flat consists of: kitchen, bathroom, 2 rooms. Flat: with floor area of 42 m2. No smoking in the facility. The facility is open: during summer holiday. We do not accept guests with pets. We invite you to take advantage of our offer - satisfaction guaranteed. Rooms are equipped with TV. On the premises parking lot. At guests' disposal: generally accessible bathrooms, generally accessible self-service kitchen. We invite. On the premises: parking lot. We invite you to take advantage of our offer - satisfaction guaranteed. Flat consists of: 3 bedrooms, fully equipped kitchen, bathroom. Flat: with floor area of 48 m2. The facility is open: from 01.07 to 30.09. We do not accept guests with pets. No smoking in the facility. We invite you to take advantage of our offer - satisfaction guaranteed. Some rooms without bathrooms. Flats with bathrooms and kitchenettes. At guests' disposal: wireless Internet (Wi-Fi), kitchenette. Tourist attractions: architectural monuments, marina, botanical garden. At guests' disposal park. The town centre 1.5 km. The railway station 2.5 km.